Hello guys! I finally had the chance to post this homemade glazed donut recipe which my friends have been bugging me about for the last two weeks. 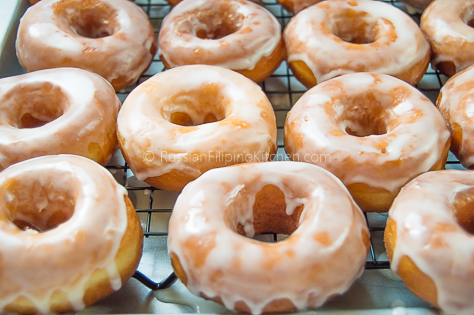 Since the time I posted photos of these donuts in my Facebook account, I received lots of requests for the recipe. While some are content to receive just the link to the original recipe, many wanted to see how it’s done step-by-step in my blog. So here I am doing that. Please read on and find out how to make it. First of all, let me tell you that this glazed donut recipe is adapted from Peggi Weaver Tebben posted at Allrecipes.com, so this is not something I came up with. But, like most recipes I adapted, I tweaked it to either suit my taste or improve some techniques. I followed the ingredients of the original recipe, except for the measurement of the flour which I reduced by 1/2 cup. 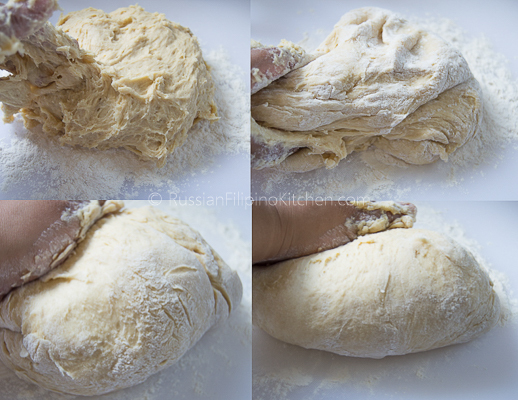 I also modified the process by kneading the dough by hand instead of using a mixer. I understand that not everyone has an electric mixer with a dough hook attachment at home. It shouldn’t be a hindrance in making these yummy donuts. With little bit of elbow grease, anybody can make them. However, if you happen to have a mixer and would like to use it, feel free to do so for convenience’s sake. My quest for the perfect yeast donut recipe actually started the summer of last year. For a long time, I wanted to learn how to make donuts even before I came to the US. But I was intimidated by the process just remembering how my late grandma used to make them by hand. 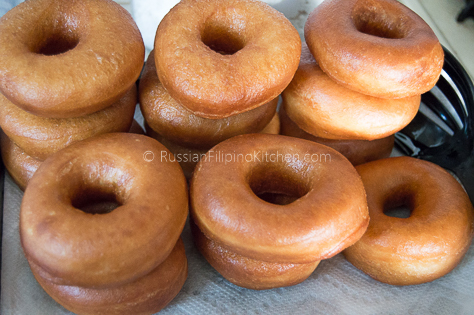 From my recollection, she made donuts by shaping the dough with her fingers, which was labor intensive. I didn’t know donut cutters existed then. But anyway, my real motivation to really find a good donut recipe came about a year ago when my husband came home from work with a bag of donuts he bought from a gas station. I knew he has a sweet tooth but what those really for is to spike up his blood sugar when it gets too low. Hubby is diabetic and have to monitor his glucose levels several times a day. Donuts are perfect when he needed a quick remedy to get his readings back to a safe level. I went online and searched for donut recipes, bookmarked those that appealed to me, and tried out every one of them. Out of 8 recipes I tried, 2 of them turned out pretty good. This recipe I’m sharing with you today is the best and the winner of them all. 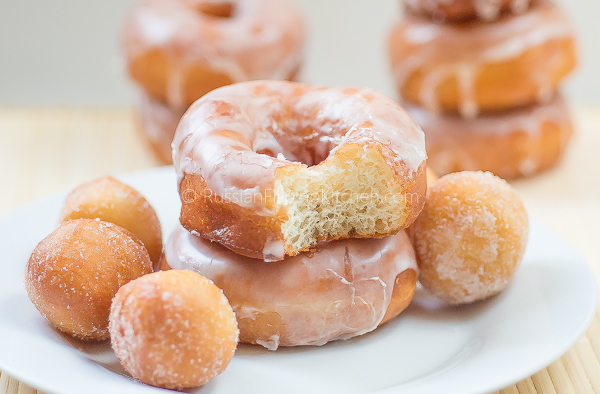 The resulting donuts are soft, light, and airy, with just a touch of crisp on the outside. It’s not sickeningly sweet like some commercial donuts out there. I fell in love with them at first bite and everybody else (including my husband and kids) who tried also love them. So, sharing this recipe is so worth it! Making yeast donuts is actually very easy, but it requires careful attention to every step. First, you need to make sure that the yeast(those little brown grains) you are using are alive or the dough will not rise. 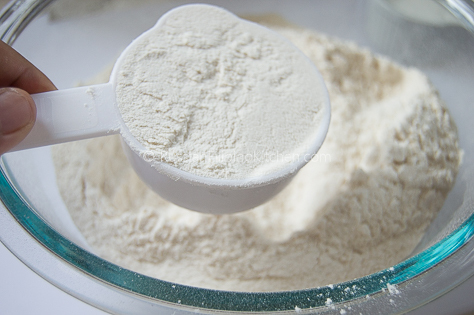 I like using active dry yeast–the ones you need to activate first in warm water and a little sugar. There are other kinds of yeast that you can use, such as rapid rise yeast which you add directly to the dry ingredients without the need for proofing/activating. But for this recipe, I’m using active dry yeast. 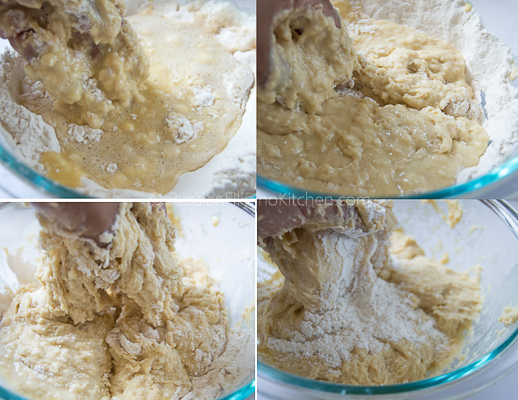 Second, you need to knead the dough properly for the gluten to form, usually taking 10 minutes if doing manually. Gluten is the protein in the flour that creates a matrix in the dough providing strength and structure. It traps the carbon dioxide gases produced by the yeast, allowing the dough to rise, resulting into soft and fluffy bread. Third, you need to give the dough enough time to rise. Depending on the temperature of your kitchen, it will take about 45 minutes to 1 1/2 hour for the dough to double in size. Don’t go by the time. Rather, pay attention to the volume of the dough. Fourth (very important tip! 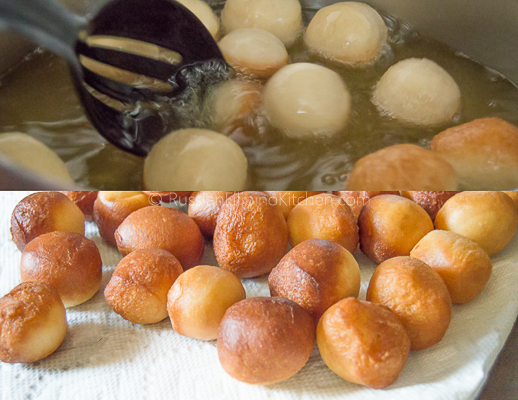 ), make sure you don’t deflate the raised donuts as you lift them off the surface on the way to the frying pan. Those precious CO2 gases formed in the dough makes your bread soft and fluffy! I learned this the hard way during my first attempt at making donuts which was a disaster. I followed the traditional recipe which unfortunately didn’t mention about being careful in handling the dough. When I was forming the donuts, I just lay them on a regular baking sheet very close to each other, with a little dusting of flour on the bottom. When they doubled in size an hour later, they stuck to each other because I forgot to consider they will expand. So I had to unstick them using a pizza cutter which, to my dismay, caused most of them to lose their shape. The worst part is when I was about to fry them, the bottom got stuck to the pan as well (even with the dusting of flour) that I had to pry them loose using the thinnest spatula I could find. All the movement I did to the dough shrunk them further, thus I ended up with flat donuts after frying! They still taste great, although appearance and texture-wise they are less desirable. My solution is to use cut up square pieces of parchment or aluminum foil and place them on the bottom of the donuts after shaping. This makes it easier to move them and helps retain their shape very well upon frying. Also, I made sure there is at least a half an inch space between 2 donuts. Fifth (also an important tip! ), you need to make sure the oil for frying is at the right temperature at 350ºF (180ºC). Below this temp, you’ll end up with greasy donuts. Higher than this number, your donuts will burn very fast. I suggest you use a deep fryer thermometer to get an accurate reading. 1. Transfer warm water into a medium bowl. Add 1 teaspoon sugar andthe yeast and stir to dissolve. Set aside until bubbles form on top, about 10 minutes. 2. Meanwhile, place milk and shortening into a microwaveable cup. Microwave till shortening is just melted, about 1 minute. You can also do this over a stove top. 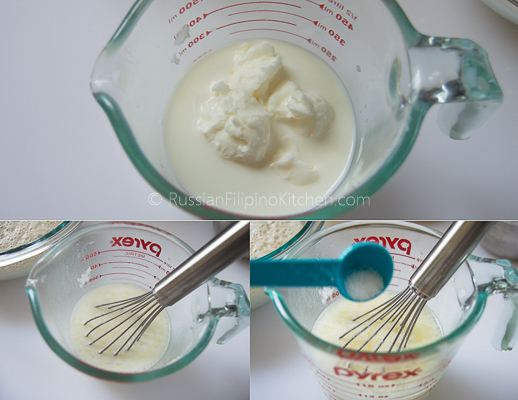 Place milk and shortening in a small sauce pan and cook over low heat until shortening melts. Remove from heat and stir. Add salt and sugar, then stir again. Set aside until ready to use. 3. Crack 2 eggs in a small bowl and beat lightly. Check temperature of milk mixture in step 2. Make sure it is warm but not too hot as you are going to add the eggs in. If it is too hot, let it cool down. Faster way to do this is to soak the cup in a cold bowl of water. Or you can just wait and let it sit on the counter for couple more minutes. When it’s warm to the touch, pour the eggs in and stir to mix. 4. Sift the flour using a fine mesh strainer. Set aside 1/2 cup for dusting later on. 5. Create a well in the center of the flour. Pour in the yeast and milk-egg mixture. Use your fingers to slowly mix the wet and dry ingredients. Add a little more flour (about 1/4 cup from the one you set aside in step 4) when needed. The dough should be a a little sticky but not too much, and should start to pull away from the side of the bowl. 6. Lightly flour a clean, flat surface and transfer dough to knead. Stretch and fold the dough repeatedly using the heel of your hands until it gets soft, smooth and elastic. Add the remaining flour slowly at a time while kneading until the dough no longer sticks to your fingers or onto the surface. Click to watch a video on how to knead dough by hand. 7. The dough should have a soft, silky texture and will spring back when poked with a finger. 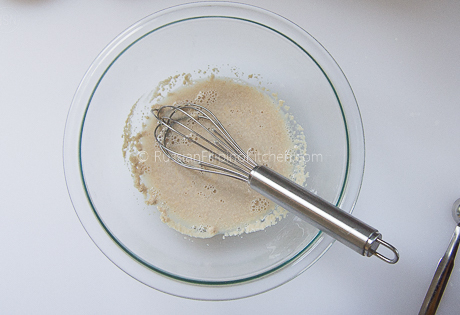 Form dough into a ball and transfer to a large mixing bowl greased with oil. Turn dough once to coat the other side. Cover with a clean kitchen towel or a plastic wrap. Let it sit in a warm place and allow to double in size, about 1 hour. 8. While the dough is getting ready, cut out parchment paper/aluminum paper into 3-inch squares, about 26 pieces. You will use this to hold individual donuts later on after shaping them. 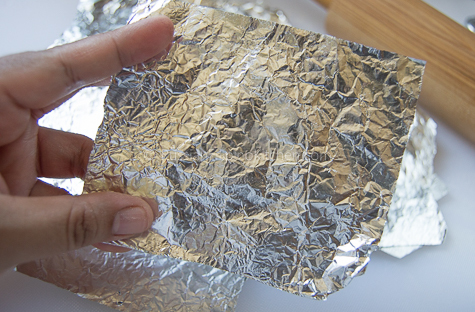 These foil look wrinkled ’cause I used it several times before. This will affect the bottom texture of the donut, though. If you want a smoother bottomed donut, use new foil every time or just use parchment or wax paper instead. 9. As soon as the dough has doubled in size, punch it down with your knuckles or press down with your fingers to release air bubbles. Transfer to a clean, flat, surface and knead a little bit. Form into a ball and cut in half. Set aside the other half while you work on the other. 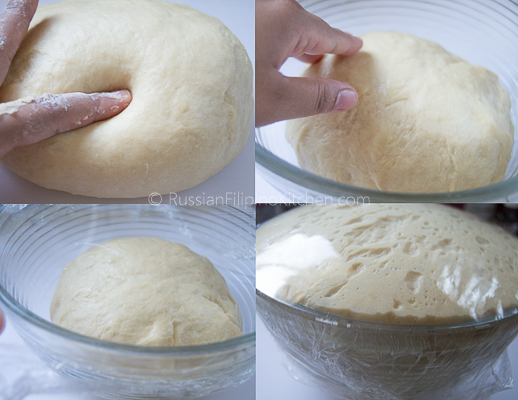 Form half of the dough into a ball. Lightly flour a rolling pin to prevent from sticking (use the additional 1/4 cup of flour for dusting) and flatten dough, stretching outwards as you go. 10. Flatten dough to about 1/4 inch thick. 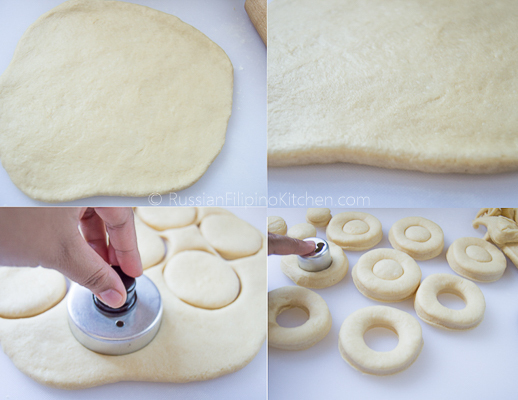 Use a 3-inch donut cutter to cut out donut shapes. 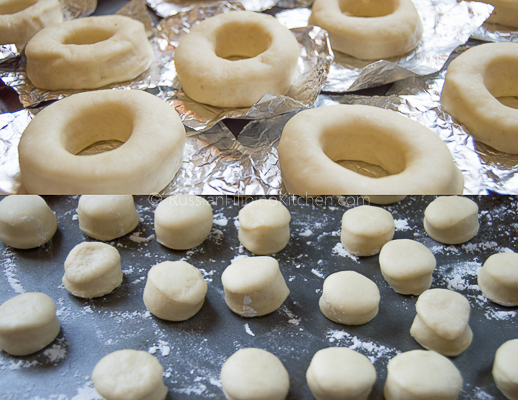 Use a smaller 1-inch cutter to cut out the donut holes in the center. If you don’t have a donut cutter, find anything that you can use that’s a circle with a 3-inch diameter, such as the lip of a drinking glass, a lid of a jar, cookie cutter, etc. Be resourceful. Work with the other half of the dough till you’re done. 11. Place donuts on individual foil/parchment paper and lay flat on a baking tray or plate 1/2 inch apart. Lightly flour a separate baking tray and place donut holes 1/2 inch apart from each other. Let them rise undisturbed in a warm place until double in size- 45 minutes to an hour. 12. Prepare the donut glaze before frying the donuts. 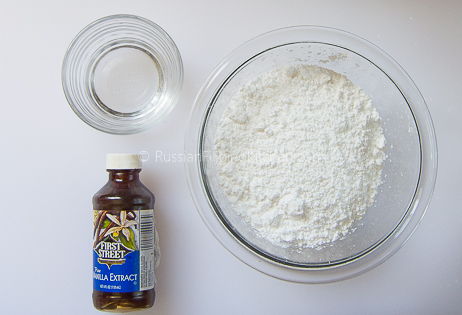 In a medium bowl, add powdered sugar, vanilla, and 1 1/2 tbsp of warm water. 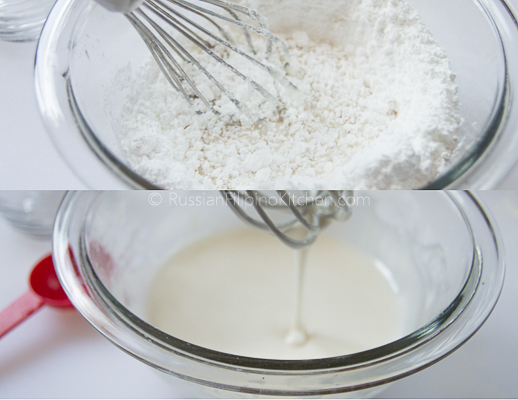 Whisk to dissolve the sugar and turn into a glaze. Set aside until ready to use. 13. Heat oil over high until it reaches 350ºF (180ºC) temperature. If you don’t have a thermometer, do the sprinkle test by sprinkling a little bit of water into the oil. It should start to sizzle. Take note that the oil shouldn’t be smoking as well. Carefully drop the donuts one at a time as fast as you can into the hot oil. I fry the donuts 5 pieces at a time so the oil temperature doesn’t drop too much. I usually count up to five in my head and turn the donuts over, and keep doing so until they are golden in color. Remove donuts from oil and place on a plate/tray lined with paper towels. Fry the rest of the donuts till you’re done. 14. Now comes frying the donut holes. This part is actually tricky since they burn very fast. What I did is turn off the stove and drop all of them at once into the fryer. It only takes less than a minute to cook them since they are smaller in size. To ensure they get cooked and turns golden color evenly, quickly use a slotted spoon or spider strainer to move them back and forth so the oil touches every surface. As soon as they turn golden color, remove quickly from the pan and drain on paper towels. 15. To glaze the donuts: Dip each donut into the glaze and hold for 2-3 seconds. Lift and let it drip before arranging them glazed side up onto a cooling rack. Place a baking tray or foil on the bottom of the rack to catch any drippings. It makes cleaning up a breeze! Glaze remaining donuts until done. 16. You can glaze the donut holes as well following step 15. But I find them better just with a light coating of sugar. Place 2 tbsp of white sugar into a medium mixing bowl. Add the warm donut holes and shake the bowl until all of them are evenly coated. 17. Serve and enjoy! Meanwhile, place milk and shortening into a microwaveable cup. Microwave till shortening is just melted, about 1 minute. You can also do this over a stove top. Place milk and shortening in a small sauce pan and cook over low heat until shortening melts. Remove from heat and stir. Add salt and sugar, then stir again. Set aside until ready to use. Crack 2 eggs in a small bowl and beat lightly. Check temperature of milk mixture in step 2. Make sure it is warm but not too hot as you are going to add the eggs in. If it is too hot, let it cool down. Faster way to do this is to soak the cup in a cold bowl of water. Or you can just wait and let it sit on the counter for couple more minutes. When it's warm to the touch, pour the eggs in and stir to mix. 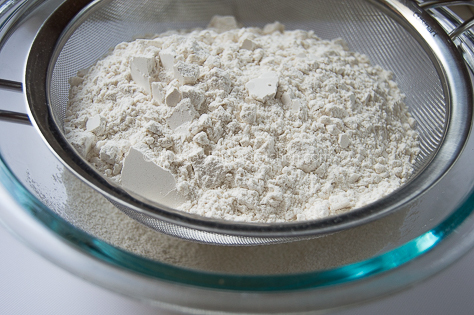 Create a well in the center of the flour. 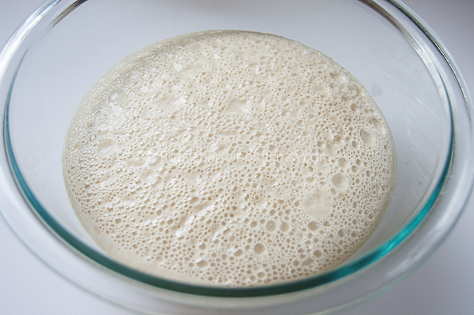 Pour in the yeast and milk-egg mixture. Use your fingers to slowly mix the wet and dry ingredients. Add a little more flour (about ¼ cup from the one you set aside in step 4) when needed. The dough should be a a little sticky but not too much, and should start to pull away from the side of the bowl. Lightly flour a clean, flat surface and transfer dough to knead. Stretch and fold the dough repeatedly using the heel of your hands until it gets soft, smooth and elastic. Add the remaining flour slowly at a time while kneading until the dough no longer sticks to your fingers or onto the surface. 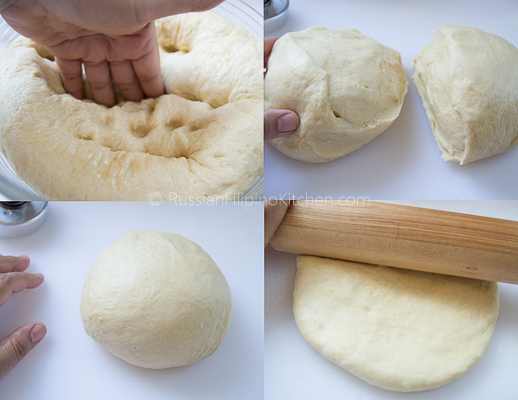 Click to watch a video on how to knead dough by hand. The dough should have a soft, silky texture and will spring back when poked with a finger. 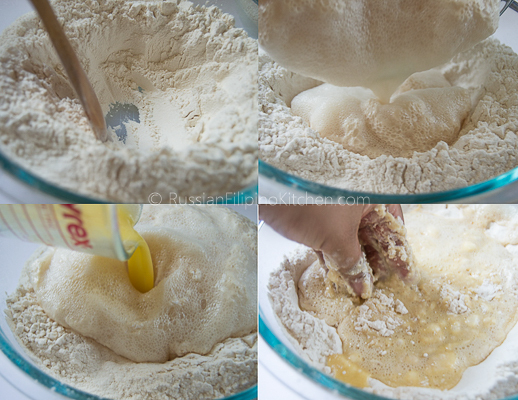 Form dough into a ball and transfer to a large mixing bowl greased with oil. Turn dough once to coat the other side. Cover with a clean kitchen towel or a plastic wrap. Let it sit in a warm place and allow to double in size, about 1 hour. While the dough is getting ready, cut out parchment paper/aluminum paper into 3-inch squares, about 26 pieces. You will use this to hold individual donuts later on after shaping them. As soon as the dough has doubled in size, punch it down with your knuckles or press down with your fingers to release air bubbles. Transfer to a clean, flat, surface and knead a little bit. Form into a ball and cut in half. Set aside the other half while you work on the other. Form half of the dough into a ball. Lightly flour a rolling pin to prevent from sticking (use the additional ¼ cup of flour for dusting) and flatten dough, stretching outwards as you go. Flatten dough to about ¼ inch thick. Use a 3-inch donut cutter to cut out donut shapes. 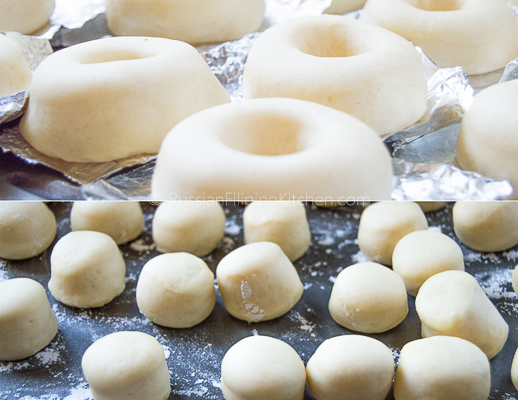 Use a smaller 1-inch cutter to cut out the donut holes in the center. If you don't have a donut cutter, find anything that you can use that's a circle with a 3-inch diameter, such as the lip of a drinking glass, a lid of a jar, cookie cutter, etc. Be resourceful. Work with the other half of the dough till you're done. 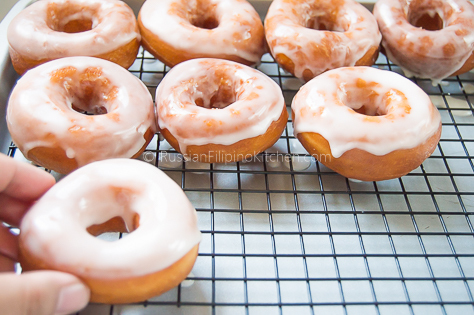 Place donuts on individual foil/parchment paper and lay flat on a baking tray or plate ½ inch apart. 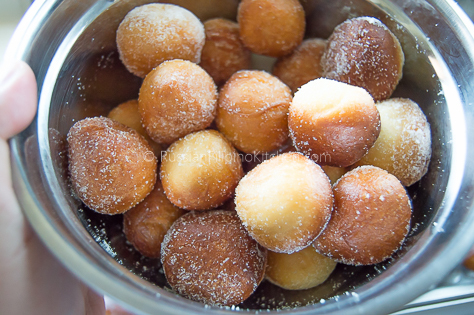 Lightly flour a separate baking tray and place donut holes ½ inch apart from each other. Let them rise undisturbed in a warm place until double in size- 45 minutes to an hour. 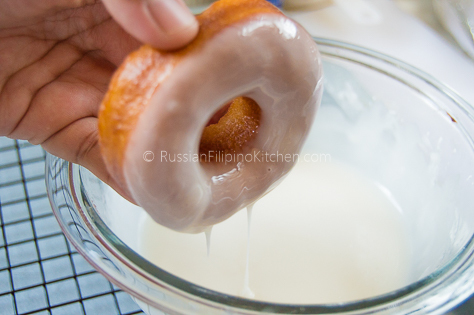 Prepare the donut glaze before frying the donuts. In a medium bowl, add powdered sugar, vanilla, and 1½ tbsp of warm water. 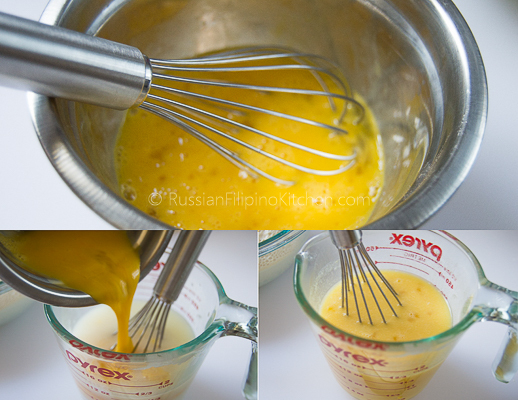 Whisk to dissolve the sugar and turn into a glaze. Set aside until ready to use. Heat oil over high until it reaches 350ºF (180ºC) temperature. If you don't have a thermometer, do the sprinkle test by sprinkling a little bit of water into the oil. It should start to sizzle. Take note that the oil shouldn't be smoking as well. Carefully drop the donuts one at a time as fast as you can into the hot oil. 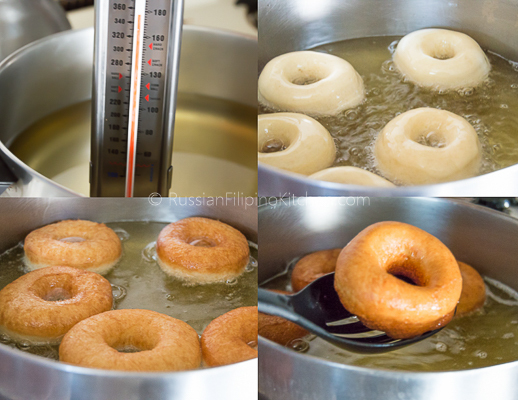 I fry the donuts 5 pieces at at a time so the oil temperature doesn't drop too much. I usually count up to five in my head and turn the donuts over, and keep doing so until they are golden in color. Remove donuts from oil and place on a plate/tray lined with paper towels. Fry the rest of the donuts till you're done. Now comes frying the donut holes. This part is actually tricky since they burn very fast. What I did is turn off the stove and drop all of them at once into the fryer. It only takes less than a minute to cook them as they are smaller. To ensure they get cooked and turned golden evenly, as soon as you drop them into the oil, quickly use a slotted spoon or spider strainer to move them back and forth so the oil touches every surface. As soon as they turn golden color, remove them quickly from the oil and drain on paper towels. You can glaze the donut holes as well following step 15. But I find them better just with a light coating of sugar. Place 2 tbsp of white sugar into a medium mixing bowl. Add the warm donut holes and shake the bowl until all of them are evenly coated. Really great donuts! Good job Mia in explaining the process in a detailed manner! I love your blog! How do I subscribe? 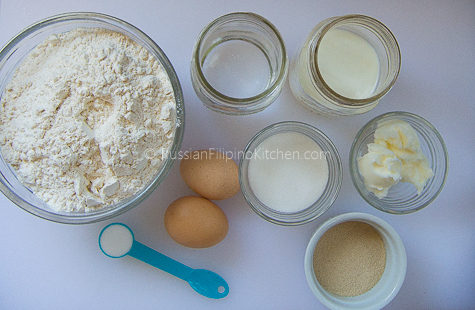 You can subscribe through the Subscribe to Mailing List box that pops up when you load the web site or through my Russian Filipino Facebook page https://www.facebook.com/russianfilipinokitchen.